Some of you may be aware that our hamster, Lorelai, sadly passed away on Sunday. 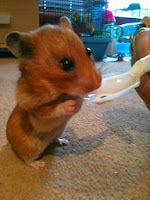 Now, as sad as that may be, she was probably the luckiest hamster in the world. First of all, she had five cages. We were determined that not only would she have as much room as she could possibly need to run around, she would never be bored. We would give her all sorts of things to play with, although most of the time she wasn't really interested in them unless it was food. Even though I was never sure if that was instinct or greed, we always kept her entertained with walnuts, seed wheels, plums, and she even stole a whole gingerbread man from our box of biscuits. The thing was at least twice the size of her! When we lived in our old flat, we used to let her run around on the floor and explore as much as she wanted. This was fine until she decided that she would find a tiny whole in the kitchen and hide under the cupboards, meaning that we had to pull apart the whole kitchen just to find her. I'm pretty sure she found this amusing, as she kept going back there, despite our efforts to stop her. One morning, at silly o'clock, I was awoken by Mike telling me that Lorelai's cage had been left open overnight and she wasn't in there. Jumping out of bed straight away, I started to help him search for her, starting of course in the kitchen. 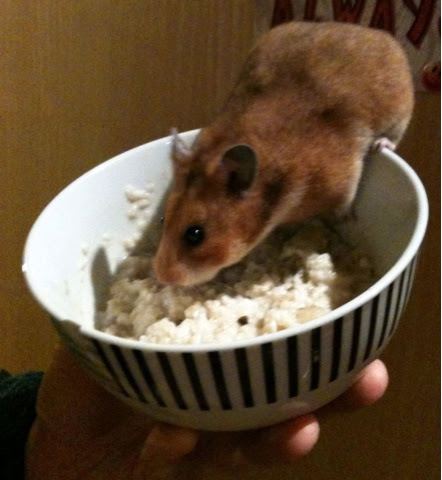 We tried to entice her out with the smell of porridge but it didn't seem to work, and after tearing the place apart we still couldn't find her. It was around this time I realised that there was a lot of piping around the kitchen that backed onto the bathroom. I went to investigate the bathroom and heard little scratchy footsteps in the wood next the toilet. I shouted Mike, telling him that I thought that I knew where she was, and as we tried to work out how to get the wood off the wall, we noticed a tiny little nose coming out of a hole on the side of the toilet, under the tank. Pulling the piping to one side so that she wouldn't get squashed, and encouraging her to squeeze out with some porridge, we finally got her out. She probably only did it for the porridge. One miniature adventure after another meant that she was never bored. 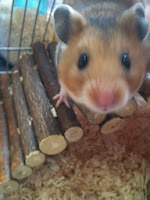 She was silly, funny, fast, often sneaky, and very smart (for a hamster). We will miss her. So finally, to Lorelai. 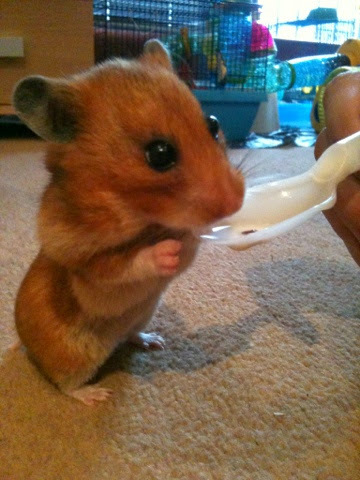 The Worlds Best Hamster.